In keeping with the mood of a very personal address, Mr Prentis finished by making a touching presentation to Tina Court. Tina recently left British Gas after 17 years, many of which were spent as branch secretary of the Yorkshire Gas branch. She was a member of the British Gas national sector committee, a member of the Energy service group executive, and an active member in her region. “Those who know Tina know she has great reputation for defending members and supporting them through challenging times,” he said. “That’s why she’s so highly regarded by members and colleagues, by UNISON and by her former employer. 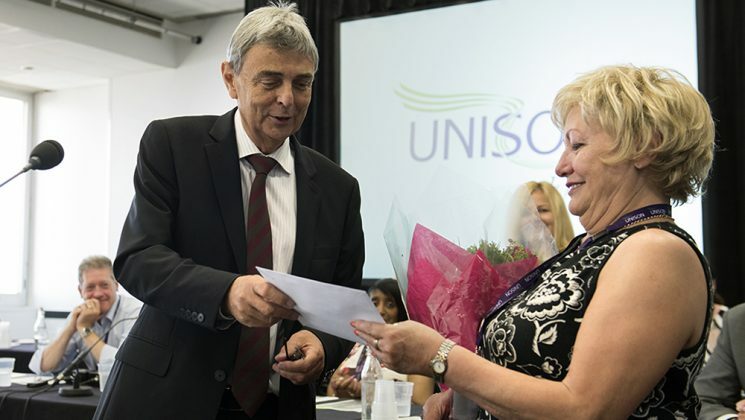 “People like Tina make UNISON a great union to be involved with – passionate, dedicated, compassionate. We are so lucky to have had you in our union Tina. “It goes without saying that you will be massively missed by all in UNISON but especially those who work in British Gas.